Modified NQD Spurt; model:Alan Bond. 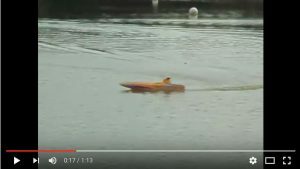 This is a conversion of an NQD ‘Spurt’ ready-to-run boat. The ‘toy’ 40Mhz radio gear has been replaced by ‘proper’ 27Mhz components and the on/off speed control has been removed and a proportional 35Amp forward only (aircraft type) ESC fitted. The bang-bang rudder system actuator has been upgraded to proportional servo control. The 7.2v 1800mAH NiCad battery – which lasted for about a minute! – has been replaced by a 7.2v 4300mAH NiMh pack. 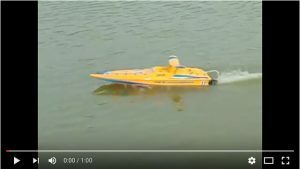 In the second video the boat has had two 7.2v batteries fitted, and the 600 sized motor was now measured to be taking 30A and a lively performance ensued. Some experimentation with trim is clearly necessary. Stll trying to get the water-cooling working properly, so cannot run for long at a time.